Keaton's Should Be on The Must-Visit List for Guy Fieri - Don't Ya Think? Doesn’t Guy Fieri have the coolest job around – hosting Diners, Drive-in and Dives? If you haven’t seen the show, he visits little eateries all over the country to get the best food in town (including barbecue). The show is not gourmet now. Fieri really does visit the little joints that draw the locals. So, if you’re looking for good stick-to-your-rib eats, you should check out the TV show and take some notes. Guy has been out in California lately crowning the “Next Pork Personality.” Seems they had a pig grill off, and Kristina Vanni of Hollywood won with her Spicy Asian Pork Tenderloin with Pear Mashed Potatoes and Grilled Baby Bok Choy. What? Haven’t tried those yet? Well, you have to remember this is California barbecue we’re talking, so they do things different out there. I am wondering if those pear mashed potatoes taste anything like the ones my sister made for Thanksgiving with applesauce. All I will say is that they did, indeed, look like mashed potatoes, but putting gravy on them was not such a great idea. It would rank right up there with gravy on ice cream which is about the only thing we don’t gravy up here in the South. In any case, I’m glad that we have all kinds of barbecue all over this country and something to appeal to every palate. I'll have to get out to California one of these days and check out what they're doing in those parts. Around here, of course, barbecue is pork served on a white bread bun with a vinegar based sauce. And, it’s some mighty fine stuff even if folks from other parts of the country often just don’t know what to make of pig pickin’ North Carolina BBQ with vinegar mop. Generally it grows on them, or I guess they move away – one or the other. 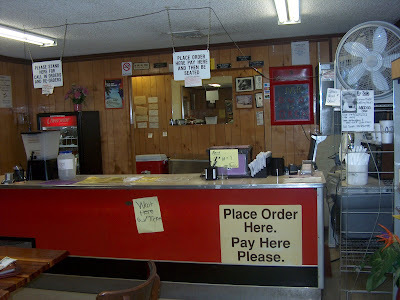 Then, there’s also Keaton’s Barbecue in Cleveland NC (sort of – really it’s in the middle of nowhere) which is chicken, and it’s barbi-fried. Yep. They fry it some way but not Southern with a thick coating and then they get it lathered up with a thin barbecue sauce that sinks to the bone. It used to be the thing to slip off from high school now and then and get some Keaton’s chicken, although I won’t confess to involvement or not in such truancy. I’m sure it’s getting old out there in California what with the great weather and all, and I think Fieri needs to road trip on out here to North Carolina and dive some barbecue joints. Heck, he won’t even have to visit three states to get his cue. In fact, he might start a Hatfield and McCoy feud again if he doesn’t showcase eastern AND western style North Carolina barbecue. Yes. There is a difference. Just ask anyone who loves NC barbecue. And, then Guy really does have to round that out with Keaton’s chicken, because it’s just the best barbecue chicken ever. If Guy needs some tips on NC barbecue, he can give me a call (-: I can hook him right up and also round up some camouflage pants and a ball cap if he doesn’t want to stand out like a sore thumb. He can also practice saying “ya’ll,” although most people from other parts of the country just can’t manage to pull that off very well. Ya’ll know what I’m saying – wink. So, any great barbecue dives from your neck of the woods that you think Guy needs to check out? If so, drop a comment. Maybe we can turn him on to some good ones. But, then we might have to wait in line at our favorite barbecue joint. Hum. Maybe you should just whisper in my ear and keep our secrets.